So, from this cover I was expecting a light-hearted read about a writing class. I almost brought it back to the library unread, but decided to read a few chapters first. Starts off okay, then starts to get weird. Really weird. This writing class has entered the Twilight Zone. I couldn’t put it down. 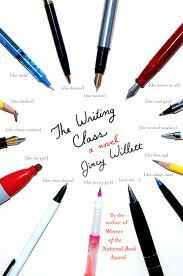 If you haven’t read Jincy Willett & are looking for something a little unusual for the summer, pick up The Writing Class.